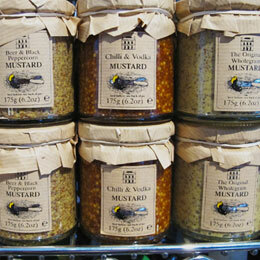 These hand-crafted mustards come in a varietiy of bold flavors straight from Scotland. With enticing combinations like Honey & Whiskey, Beer & Black Peppercorn, Chili & Vodka, and Original Wholegrain, these spreads will most definitely compliment cheese trays or holiday platters this season. We also think they make great gifts for the booze aficionados that you roll with, because you can always rely on their drink of choice to guide you in your gift giving. And for the non-drinkers, there's always the Original Wholegrain, of course. But if you're looking to pair some cheeses for a snack or to impress your friends during their next dinner party (not that you already don't) we'd suggest the Honey & Whiskey Mustard to go with our dynanic Avonlea Cheddar our our fruity Piave. For the Beer & Black Peppercorn Mustard definitely try our chalky and butterscotch-y aged Borenkass. And with the Chili & Vodka Mustard, we'd recommend our salty manchego or grassy, earthy Lou Bergier. And lastly, for the Original Wholegrain Mustard, well you can't really go wrong, but we'd suggest nutty Comte or complex aged Gruyere. If that doesn't make your stomach growl, well then, you're SOL.